TEPCO released significant new information about the plan and progress for dealing with unit 3’s spent fuel pool. The report was buried among other documents related to periodic reporting and didn’t receive any press in Japan. Radiation levels are a constant problem for this work effort. 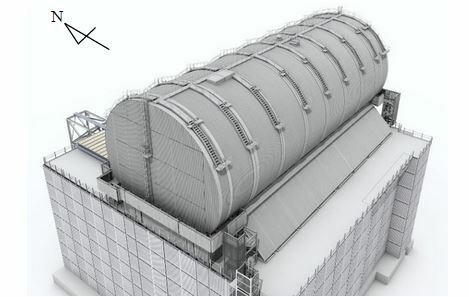 A significant portion of the planning has gone into ways to lower the radiation doses on the refueling floor even though work such as crane operations will be done remotely from another building. Damage to the building structure is another major challenge. The defueling building and any shielding must be designed to not further damage unstable portions of the building. The defueling building will span over the existing remains of unit 3. Footings will run down to the ground on one side and to an accessory building on the other. 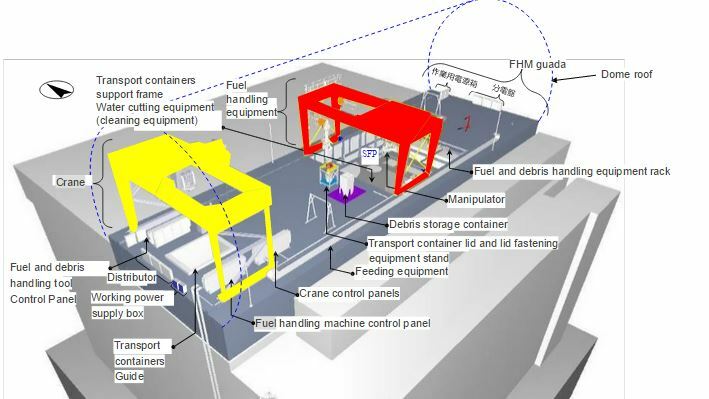 TEPCO also included a diagram to explain the proposed work flow process for removing the fuel. Installation of the defueling building is currently scheduled for mid 2016. Fuel removal would start in early 2018. All of this is dependent on being able to decontaminate further. 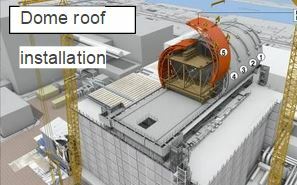 The work floor for the fuel removal is planned to be 6 meters above the actual building in an attempt to lower radiation levels. 250mm of shielding panels will be put over the reactor well area. Installation of the defueling building will be done as modules to prevent excess work being done on site. Radiation levels are going to be a problem not just for any workers that might have to do some sort of hands on work but to equipment installed over time. High levels of radiation can damage electronics. The actual defueling building has already been built. A dry run assembly was done in 2014 at the storage facility at Onahama Port near Fukushima Daiichi. The building now sits disassembled at the port waiting for installation on site. Installing the girder for the new fuel handling machine will require human intervention. A combination of shared work among teams of workers and temporary shielding panels are planned to try to keep worker doses in legal limits. 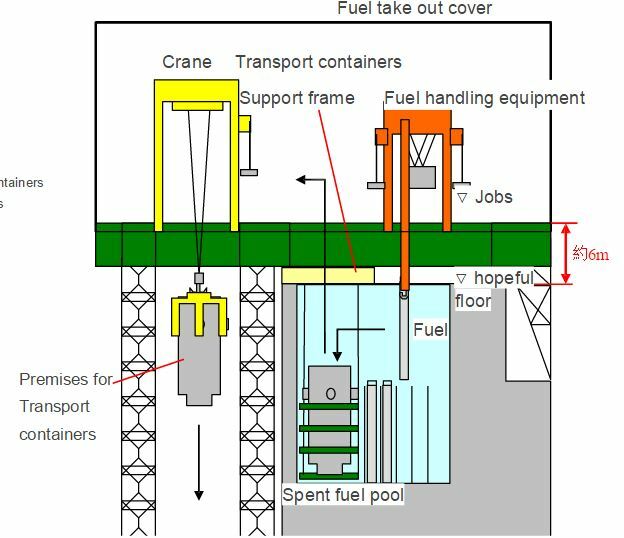 In the plan for the actual fuel removal TEPCO includes a process for removing small debris from the pool using a two armed crane. It also shows a fairly standard removal of fuel assemblies. In addition they show what appears to be a contingency plan on removing fuel assemblies if they are not intact. 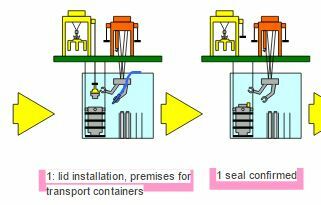 TEPCO doesn’t elaborate if this is just contingency planning or if they have reason to believe certain fuel assemblies are damaged. They are currently still working on removing the old refueling crane from the pool. The 75 ton fuel handling crane to be used includes both a typical fuel removal rig and the two handed robot. The crane that will stand in for an overhead crane will likely be used to handle the loaded casks. Both cranes were made in the US, TEPCO does not say by whom. Since all of the work will be done remotely 22 cameras will be used on or near the cranes to allow remote workers to see what they are doing. 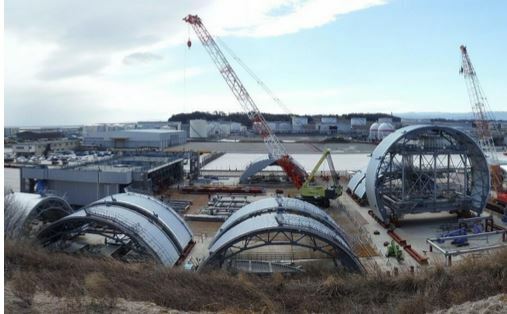 Workers are currently training at a “training facility”, likely the new off site training facility built in Fukushima prefecture.